The ability to precision cut metal, weld and powder coat, all in one location, means we are in a somewhat unique position. We can help fully realise peoples own ideas and designs. Combing all our services and inventiveness, we are able to provide light fabrication services. We offer initial free advice, ideas, discussions, preliminary designs and price estimates can be followed by visits if required to define your personal requirements. Engineering is hammering imagination into substance. We have cut and powder coated metal to make the metal hearth for for a wood burning stove. In addition, we have elliptical rings and baffles to help seal where flues enter and exit walls. Also made replacement or decorative fire grids, ash collecting trays, flues and other various items for both indoor and outdoor stoves. In some cases these have then been powder coated on completion. Signs, Decorative Metal Panels, Coat Hangers etc. We can incorporate metal designs cut using the CNC Plasma Cutter into hanging signs, decorative gate & fence panels, coat hangers etc. Designs can then be Powder Coated in a colour of your choice to give an attractive and durable finish. We can help with a full, design & manufacture service. We have used the CNC Plasma Cutter & CNC Mill to make various functional, replacement and custom components. Brackets for Pump Track People. Pan adapter for a Kelly Kettle Camping Stove. Replacement Rocker cover for classic AJS & Matchless Motorbikes. Replacement latch for a Parrot Cage. 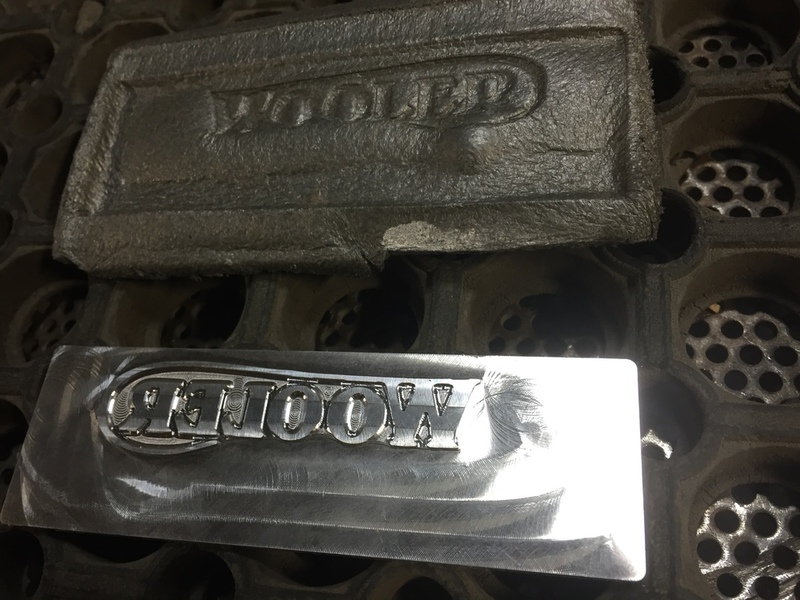 Tool to emboss Wooler logo onto a leather saddle. Copy a rare axle height gauge for Abbot Self Propelled Gun. 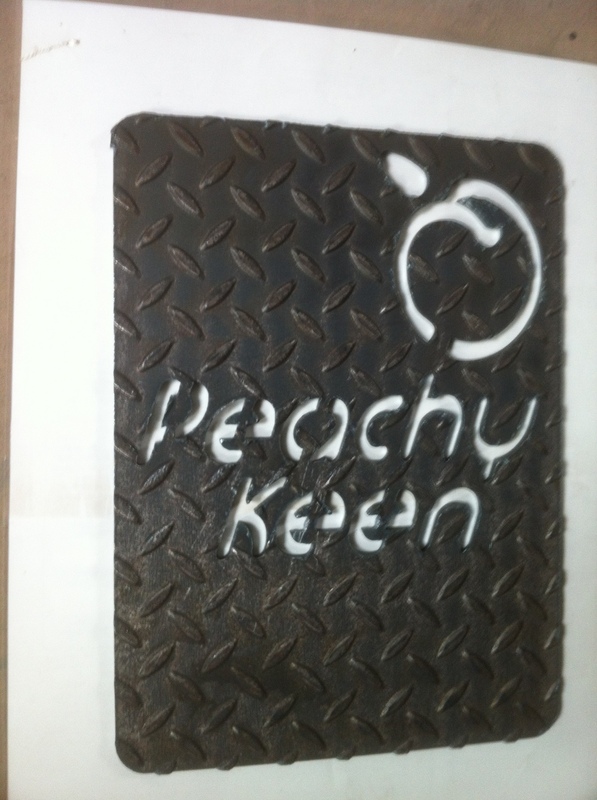 We have provided numerous varied services to Peachy Keen in recent years. CNC Plasma Cutting to make components for the "pods", signage and display stands, incorporating their name, logo and motto. These have then been Powder Coated in their corporate colours of Kawasaki Green & Traffic Light Red. Recently we have been heavily involved in helping develop their prototype "Hand Crank" which required CNC machining of Aluminium and Perspex to make and modify components. Take a look at our Projects & Ideas Gallery for further examples - Peachy Keen. Realise some ideas for Custom Components. Most are mainly for Air-cooled VWs at he moment, however, with Coco's fertile imagination it won't be long before other marques will receive his attention. Take a look at our Projects & Ideas Gallery for further examples - Coco's Kustoms. We manufacture our own exclusive range of extremely robust and effective Outdoor Patio Fires in a variety of sizes. Patio fires are cut from 2mm steel. We can then cut out decorative designs and lettering according to individual wishes. Patio fires are not painted or coated and develop an attractive even weathered patina of rust. Wood is an ideal fuel as wood fires burn from the top down, negating the necessity for a grate. The majority of the fire’s heat is reflected out through the front opening. This helps concentrate the heat where needed and protects the surrounding area. Fires could be used on wooden decking with the addition of a metal plate underneath to give protection from falling embers. Used CNC Plasma Cutter to cut "Nashy's" name into sheet metal. This was then incorporated into a customised fire grate and mantlepiece, that was designed and manufactured by ourselves.